They came in droves. Hundreds of them to be exact. Horses, riders, pit crews and volunteers from 13 states converged upon Jubilee Park in Ivanhoe Thursday through Saturday. Huge RV-style horse trailers rolled into the park beginning Wednesday for the inaugural Virginia Highlands 30- and 55-mile Endurance Challenges. Trailers were parked in neat rows until it seemed not another trailer would fit. But fit they did, and finally it appears that Jubilee Park has been revived. The challenge was the idea of local endurance riders Don and Nikki Meuten of Ivanhoe, and Tom and Gina Hagis of Fries. For nearly a year, the couples have worked with the national forest service to plan the trail courses, set up a Web site, hire veterinarians and gather a core group of volunteers to host the event. Jubilee Park, originally founded by the Ivanhoe Bridle Club in the mid-1980s, hosted its last major horse show in 1998. The park, which is nestled on approximately 14 acres along the New River just a quarter mile off highway 94 in Ivanhoe, is the perfect setting for hosting such events. With direct access to the state-operated New River Trail, recreational enthusiasts from all over can enjoy horseback riding, biking and walking from the park. During the 1990s, the Ivanhoe Volunteer Fire Department held all-breed horse shows at Jubilee Park as fundraisers. After the last horseshow was hosted in 1998, the park lost its access into the grounds off Carbide Road, and had to close to the public for several years. By 2005, a new road had been established off Trestle Road going under the New River Trail, and the fire department held its first poker run trail ride as a fundraiser at Jubilee Park. The annual poker ride has helped the fire department purchase new equipment. This year’s poker ride will be held this coming weekend Aug. 29 and 30 at Jubilee Park. This past spring, the fire department and Wythe County officials met to discuss the fire department gaining control of the park grounds to host fundraisers and horse events on a regular basis. Once it was official, the volunteers from the fire department got busy cleaning up the over-grown areas of the park and tearing down the dilapidated arena. Todd Hyatt, a 17-year member of the department, has been instrumental in reviving the park. He and other members have used mowers, weed trimmers and disking equipment until the park fairly shines once again. Hyatt partnered with Myers Lumber of Hillsville, which donated the boards needed to rebuild the riding arena. The fire department team is in process of working with the power company and the New River Trail officials to bring electricity into the park soon. It is expected to be fully operational with electric, water and a new arena by next spring. Any breed of horse or mule may enter endurance rides, but many endurance riders prefer Arabians and half-Arabians for their extreme athleticism, speed and heart recoveries. Two weeks prior to the event, the organizers knew they had their hands full. The entries were piling in, and the two-day rides now had over 200 horses entered. More volunteers were rounded up to man the road crossings, water trucks and veterinary check points. Ivanhoe volunteer fire department would be crucial in their help with the water truck to fill water tanks for horses in camp. Thousands of gallons of water would be consumed during the three days. Another local Fries couple, Bill and Nancy Sluys, helped the Hagises mark the trails, which consisted of a 55-mile continuous loop mainly along the Virginia Highlands horse trail. The 30-mile trail followed much of the same course, then separated from the 55’s to loop back to Jubilee Park after both rides had a vet check at Iron Mountain Horse Camp on Brush Creek Road each day. The veterinary check points are mandatory, and are designed to give each horse a rigorous physical exam before it can continue on the trail. The horses must pass a cardiac recovery test, a lameness exam and an overall physical in which the veterinary team will check for soreness, wounds or fatigue which would impair the horse’s ability to complete the ride. After the horse and rider completes the course, a final veterinary inspection takes place to ensure that the horse is sound and would be fit enough to continue if necessary. Thursday evening, ride manager Don Meuten conducted a pre-ride briefing for the 125 riders who were going out on Friday’s rides. Eighty-five 55-mile entries and 40 30-mile entries along with their pit crews and family members gathered near the stage to hear critical information about the trail and rules of the ride. Meuten teaches at the University of North Carolina Vet School, and his light-hearted jokes and bantering had the crowd roaring with laughter. Friday morning dawned clear and cool- a perfect day for an endurance ride. The 55-mile ride started at 7 a.m., and the horses thundered out of camp to a call from the timer of “the trail is now open”! Ivanhoe firefighter John Pearman came down to the old railroad trestle with his young nieces to watch the start. “It sounded like a car race starting with the pounding of all those hooves coming down the gravel road at once,” he said. Pearman, who’s been around horses all his life, mentioned he had never seen anything quite like the start of this horse ride. Most of the technical part of the trail had to be negotiated by the horses in the first three miles as they climbed up out of the river bed on a narrow one-track trail. During the course, several elevation changes took place which had the horses ascending and descending a couple thousand feet. Valerie Kanavy, a world champion endurance rider from Fort Valley had several horses entered. “The course was somewhat rockier than I expected, but the trail was fast, beautiful and well-marked,” she said. Kanavy finished second in the 55-mile ride on her Arabian mare “Saager.” Seventy-nine horses completed the 55-mile ride and 37 completed the 30 miler. Friday evening, a supper was hosted by the Ivanhoe Civic League, whose president Maxine Waller headed up the crew. Following supper, an awards ceremony for Friday’s rides and a pre-ride briefing for Saturday’s rides were held. 55 mile rider Jeremy Reynolds of Richmond and his Arabian horse took top honors with a winning time of five hours and 43 minutes. Saturday morning was cloudy and cool: “Another fine day for riding fast horses,” shouted Shelley Scott-Jones of Dalton, Ga., as she cantered past the photographer midday. 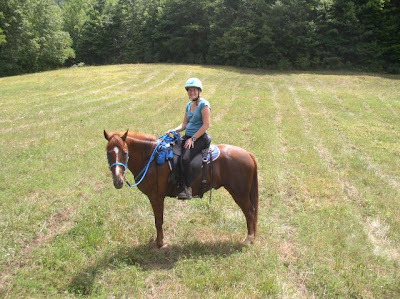 Jennifer Wertz of Ivanhoe rode Randy Sayer’s horse “Flash” on the 30-mile ride Saturday. This was the first competitive event for the 4-year-old spotted walking horse and his rider. Sayers and his family have raised Tennessee walking horses in Ivanhoe for over 50 years and Sayers has shown horses at Jubilee Park since he was a young boy. Wertz and “Flash” came in 29th with a clean vet score. Overall, the comments heard from riders about the caliber of this event were positive and up-beat. Nearly all riders said they would return next year. Organizers are already planning for next year. If you would like to attend the Ivanhoe Poker Ride and/or pig picking this Saturday at Jubilee Park, contact Todd Hyatt at (276) 620-0225 or Keith Burnett at (276) 699-2421. Becky Siler is a freelancer writer who lives in Cripple Creek. Sleeping in the back of the truck wasn't all that bad. I had a pillow and a sleeping bag and the seat was fine. I was a little tall for the width of the truck however and found that I could stretch out one leg by curving it around and the other leg was bent. I woke up off and on throughout the night and felt... damp. Just clammy. Yuk. Well what are you going to do? At about 5:30 am I woke up and although it was dark I could see my camp neighbors were packing up their SUV. They were being pretty quiet but if they were up that must mean that it was about time for me to get up (never-mind that they were 55s with a start time an hour earlier than me). So I got up and put on my boots and tromped on down to the porta-potty. Coming back I wasn't sure what to do because if Kim was sleeping I didn't want to wake her up. So I walked down to the water trough and hauled back two buckets for the boys. Red drank a little which I was glad to see. I took off my boots and crawled back into the truck to see if I couldn't get another 30 minutes of rest. Well not 10 minutes went by and Kim was up. So I got back out of the truck and Kim asked me if I knew the horses mysteriously had water. I said yes, I hauled it up for them. So she went off to the porta-potty (so much for her fancy personal toilet I guess) and I fed the horses, brushed my teeth and put up my hair. Kim came back and we had cereal (the good kind with strawberries and blueberries) which we topped off with a fresh banana for a breakfast of champions. After that there was enough light to see by so I did some final packing of my saddle bags and we got the horses tied to the trailer and started tacking up. Kim was ready to go in no time flat, I couldn't believe it! I had to get a little help from her on Red's girth, it was a leather western style one. Well Kim had everything color-coordinated, from our helmet covers to the plates we ate off of, I have never seen such a thing, it was really fun. We were ready to go right on schedule so we mounted up (I had to use a bucket, Red is taller than I am used to, and I had adjusted the stirrups pretty short). Red doesn't wait around so it was a bit of a jump to get on him as he walked off. We walked the horses down to the start and asked if anyone was taking numbers. They weren't ready so we walked some more circles back towards our trailer and Kim put Falcon to work since he was acting fairly co-dependent on Red. Red didn't seem to have a problem with leaving Falcon so I told Kim for the trot-out she should go first. We went back to the start, it is 7:50 or so and they are still not taking any numbers. So I told Kim we should walk the horses towards the registration table at the other end, she wanted to get out of the crowd of horses that had gathered. Red's walk was no-nonsense, we are going some place which was nice to ride, a ground-covering rocking stride. We warmed up and stopped at the big water trough. I was glad to see Falcon drinking but Red wasn't interested. By the time we got back to the start everyone had left and they told Kim to trot out. I waited for her to get ahead of me a little because at the ride meeting they had specified ONE AT A TIME. Not two seconds later and the out timer said "The trail is open, you may go" so I don't know if there was anyone there even checking the gait of the horses. We caught up with Kim quickly and the horses were eager to go. We had a short canter and coming back down to a trot I was able to get Red gaiting for about a minute before he broke back into a trot. It was awesome. Kim said I was lucky to get a minute from him. We followed the trail as it went up on the jeep road and then went to single track. In the start, Red did a fair amount of leading, but we had horses not to far away from us and he was chasing them. 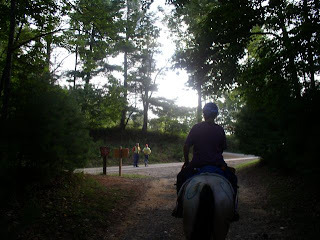 We got on the trail that started up the mountain and we were MOVING, I remember a very fast trot and sometimes a canter as we wound around some sharp corners. It was incredible. The trails were beautiful and great footing. We came to a dry river bed and it had some big rocks but Kim commented that this was nothing, the trail was much better than she expected. Well, famous last words, right? We reach highway 94 (6 mi) at just about an hour into the ride. We were at the tail end, although there was a lady on a leopard appaloosa not far ahead of us, and a gal on a really pretty chestnut Arab behind us (I can't let you get behind me because I am competing for the turtle award, she told us) After crossing with the aid of the fire department we reach a nice water stop. Kim dismounted and sponged both the horses (bless her!) Red still would not drink. Onward we went, climbing the hills and walking our way through the rocky sections (which were becoming more frequent). Every so often I would pull out the camera and try to get a photo of the trail or the view. We were both having such a good time, it was a blast to finally ride with Kim as an adult. She has been my inspiration for endurance riding and now finally we have the chance to do it together. Her first competition ride and my fourth this year. She was great company! The vet check was right about half way and I had heard that if we didn't make it in by noon we would not complete the ride on time. We pulled in about 11:20 I think. Crews were allowed on the left side of the road only. Our crew bags had been delivered and were on the right side of the road. We had dismounted to walk them in and were trying to figure out what the next step was. I think we lost a couple minutes just trying to think at that point in time. Finally I told Kim to grab the crew bag and set it on the left somewhere so we could dump the tack and go down to vet through. It was hard to find a spot, it looked like some places were reserved for... who? 55s coming later? Well we squeeze in a place and it looked like it would work. Ok! This ride said tack off for all vets. We then took the horses down to the water tanks. Falcon drank, Red did not. Geez! 13+ miles and still not thirsty? I was starting to worry about him a little bit. I asked for a pulse and a friendly man came over and took it. I think he was down to 60 and the criteria for this hold was 64. The man asked me how he was doing. I said he seemed a little tired but I thought he was ok. We chatted a couple minutes while I waited in line for the vet. In the meantime I let Red graze. The vet checked him out and scored him high on everything but a B on gut sounds. We did our trot out and no problem there either. I noticed Kim was going through with Falcon at the same time at the other vet so I let Red graze nearby since no one else was waiting at the time. Well Falcon did not like his vet, he would not stand still for her to listen to his HR or gut sounds and worked himself up trying to get away from her. It took a significant amount of time to get him vetted through. Finally he passed but scored a C on gut sounds so the vet told Kim to come back and get rechecked before we headed out. They told her to feed him everything he would eat in the meantime so we headed back to our crew area for our 40 min hold. Kim had their grain/e-lyte mix all ready to go in their tubs and told me just to pour some water on it so I used what was left in the bottles in my pack. Sure enough he slurped it right down. I ate my PB&J sandwich, it was so good. I also downed a whole bottle of fruit punch gatorade and it was still partially frozen. Yum! I swapped out the water bottles in my pack and that was about all I had to do. We weren't sure if the vet wanted to see Falcon before or after we tacked up, so we decided to go back down there before. We stopped again at the water tanks and this time, FINALLY Red decided to drink...and drink...and drink. Wow, he was not messing around. So I let him drink as much as he wanted and in the meantime Kim had made her way over back to the vet. This time they gave Falcon a B on gut sounds so back we went to our crew area to tack up. I held Falcon while Kim got her saddle on and then she held Red while I hoisted up his saddle. I had her girth him up for me again because she is faster and better at it and he blows out and she does real well with him on that. Kim put our crew bag back in the pile for pick-up and then we walked the horses down back to the vet before re-checking the girths and mounting up. Well I had to lead Red over to the side of the mountain to get a leg-up on him. Off we went. On the ride out Kim mused that we never got our ice cream, never even saw any of the ice cream. Oh well, it would have been just another thing to fuss with and we had our hands full as it was. The trail out was good footing for awhile and then it turned to rocks. Rocks, rocks, rocks. Slow going for quite a while. I was keeping an eye on the time and figured we were ok. Kim was watching her GPS but the milage was shorter than it should have been. Oh well. We passed that group of people, again going the opposite direction, and again the man telling us to "step it up if we were going to make it in time." This time Kim told him we were just taking it easy with first-time horses. We had someone catch up with us and pass us and about then we caught up to the gal on the pretty chestnut who wanted the turtle. So we passed her and rode along, trying to "never hurry, never tally" like Stagg had told us. After awhile we got onto a private gravel road and saw a lost boot. About a minute later I saw a man on foot leading his horse. I asked if he lost a boot, he said Yes and we pointed back to where he could find it. Then the road turned and went up the mountain. The plate sign on a tree said "1 mile climb" so onward we went. At the base was a woman walking her horse, she said they were ok but waiting for a trailer to come and give them a ride back to camp. I think the gal following us knew her because she stopped and talked with her a while. At the top of the climb was a water tank. The horses drank and Kim went off in the woods to pee. I ate a fig newton. Falcon acted like he wanted some so I gave him one and he spit it out. Kim came back and mounted up and off we went again. Just then the other gal appeared, on foot, leading her horse on up. Said they were doing good. We rode the ridgeline for awhile and trotted as much as we could, knowing we were getting short on time now. According to the map, we had a 'lollipop course' today meaning we would ride out and back in on the same trail, and the outer trail was a loop around with the vet check in the center. We made it back to the stick part of the trail and eventually made it to highway 94 again. I knew we were 6 miles from camp and we had made it up in an hour, so giving ourselves an hour and a half to get back down should be no problem. We get a move on and trot trot trot. Sometimes Red canters short bursts on the uphill but I was unable to get him to gait anymore since that one nice moment on the way out. I forgot to mention I had seen someone at the vet check with a New Promise Farms Crew t-shirt on on a gaited horse and I talked to her a little bit and she gave me some pointers- sit deep in the saddle, ask the horse to collect and squeeze with your legs and he should go right into it. Well I tried and tried but never was able to get it from him. Part of the problem was his trot was so big and so fast that it threw me right up out of the saddle and "sitting deep" at the trot was just about impossible. Well we are cruising around and up and down and not remembering all these uphills. We are looking for the switchbacks, knowing they were fairly early in the ride. On and on and on we went and Kim is convinced I have my time wrong and we are not going to make it. Maybe she is right. Well we finally get to the switchbacks and I made the mistake of looking down on a sharp turn. I immediately felt sick to my stomach and lightheaded. I just focused on breathing and looking ahead (and not down!) oh wow, I have never felt so sick on a horse before and this is all my own fault. I am a bit scared of heights. Well we made it past the knee-knocker trees and down the mountain and still have a ways to go. When we made it back to the jeep trail, some 55s came cantering past us. Red suddenly realized he was close to home and now he had someone to follow! So he took the lead and just ran his heart out. It was glorious. He had tried bucking with me a couple times this ride but now that was the furthest thing from his mind has he happily ran towards 'home.' I heard Kim wait "Wait for us!" and I pulled him down to a trot until she caught up and then off we went again. We ran and ran and ran. The 55s lost us and then we slowed the horses down to a trot. We got back on the gravel road and saw the finish line. I started tearing up. We had made it. I looked back and smiled. I tried to say "now is when I get all emotional" and Kim said "I can't even talk right now!" We dismounted and walked the horses back to the trailer. We dumped our saddles and walked them to the vet check. I glanced at the time and we had about 10 minutes to go until cut-off time (3:15 pm) Red walked over and pulsed in at 48. (WOW!) Kim asked for a courtesy check on Falcon and he was still up there, about 86. Michael told her to get the hay out of his mouth and not let him eat since the very act could be keeping his HR up. I had never heard that but within 5 minutes he called for time on number CO. (Forgot to mention, Red was number CN) I think he pulsed in with only a minute to spare. Vetting through, Red did excellent, mostly A's from what I can remember, maybe a B on gut sounds and muscle tone. They let me keep my vet card so I will try to scan it in when I get back home. This was a fabulous ride and one I shall never forget. I know I have left out a lot of little details so will try and put them in later as I remember them. After we vetted through we put the horses up with water and hay and sat down with some food for ourselves. We had boiled eggs from Kim's chickens, potato salad Kim had made, more frozen gatorade (Kim said "I think this is the best thing I have ever had") chips with salsa Kim had made. I am sure there was more but I am forgetting what. We rested and reminisced and once we had the energy we got up and took the horses for another walk. We hand-grazed them probably about an hour and then I got tired of Red dragging me all around so we put them up and I don't remember what after that, I think by then it was about time for dinner. So we took our chairs this time and walked back down to the meeting area. They were just opening up the tables for dinner, and MY what a spread! They had a table for meat eaters and a seperate table for vegetarians - bless them! There was chili beans and chips and lettuce and tomatoes and onions for a make-it-yourself taco salad. They encouraged me to take two plates so I could fit all the food that they were about to give me. A woman told me "honey, you ain't lived until you've had this cornbread salad" so I tried that too. There were fresh canned green beans and fantastic off-the-cob-corn; potato salad, pasta salad and rolls. Seems like there was even more of that, I just could not believe ALL THAT FOOD! The ladies really outdid themselves and I have to say a huge thank you to them for that wonderful meal. I sat down and started in on my first plate. I got through it and then looked up to see my dad and Matt and Levi walking up. Yay! Levi was hungry so he ate a fair amount of my taco salad and green beans and corn. Later I also shared my cake with him too. There was about 12 kinds of cake and one was even in the shape of a horse! The chocolate kind I selected was so moist and good. There were a number of igloos for juice and tea and I saw one labeled sweet tea so I had to take some of that. I was a little disappointed though, it was warm and not sweet at all. Oh well, can't really complain, everything else was soooo awesome. Kim said "this is the south, and they FEED you in the south!" Awards seemed to start a little late and my dad pulled his car up close and sat in it at the back since we only had the two chairs. They started out by calling out the last people completed - Kim and I, and mispronounced both our names. I expect that with my name - Shana - most people get it wrong, but Kim Patton - they said Payton I think, but no bother. Don said he had put out the award for rider most traveled and I won that since I came from WA but he also said he expected it to go to the person who brought their horse the farthest, and if anyone was there who thought it could be them to let him know and there may be a free ride entry in it for them. The award shirts were cute - a cartoon sketch of a horse and rider with their thought balloons overhead. As for the turtle award - there was none! But Kim would have won it being the last person in. The other gal ended up pulling at the finish, she said her horse was a little stiff and and off at the end. This ride was to be my 3rd 50 miler. We had completed Hickory Creek 50 and Ride Between the Rivers 50 earlier and had started out with the Hornswaggle doing a 25, and then Michaux Madness 30.
more or less! Only 42 miles away! We get vetted in for the Saturday 50, no problem. We (my 10 yo Morgan gelding Ivan and I) started about mid way in the pack. Trotting along and having a good old time. up?. And let me tell you, those two rides were muddy, sloppy, miry, and messy?. The four boots stayed on with no problems? miles I don?t want to take chances. get off and put the boot back on, and say a prayer. boot comes undone AGAIN a little bit further up trail!!!! other one as well... I tell everyone else to continue on, that I would be fine? with the other horses, AND LEAVES ME OUT THERE ON THE TRAIL ALL ALONE!!!!!!!! would catch my BAD horse and tie him. managed to get off the horse in the other. help pulse in in-coming riders, help riders cool their horses etc?. What could I do? There was time to worry later. Up over logs, bending around trees, up hills, down hills, yippee! This was fun! Get to the creek that said horse was supposed to be at ?. But no horse!? know that there was vandalism AND that the horse was not there!!!!!! should be strung to the left after coming out of the creek. Finally! We get to the second creek crossing and there?s my guy! his photos!!!!! What a guy! THANKS Matt!!!!! Rather than an RO! Ha ha ha? with this now, could I? change my ride to the next day. So, both Vets agreed, as well as the ride manager Laura Riddle, that I could. Now you see, Laura had some revenge in mind for my horse! and she walked almost TEN MILES back to camp!!!!!!! She was NOT a happy Ride Manager, oh no! So, Laura, Vengeance was served! Ivan (the Terrible) had his sorry A_ _ ridden on Sunday! Sundays ride wasn?t quite as eventful now?thank goodness! haven?t lost your horse yet!? He pulled and pulled the first two loops?. Made me work! The loops were WHITE 11 miles, ORANGE 14, ORANGE 14, and WHITE 11. Heading back out on that second 14 mile loop, he was a DOG! HALF of Jim?s age was sucking wind! Wendy and I came in together to share the Turtle award. Yeah!!!!! Another 50, albeit SLOW, under Ivan?s hooves. This was one of the EGB rides that was hosting Pony Club classes, so we thought we should patronise this ride despite the fact that Jim and Natasha were aiming to ride the 30k Novice CR, rather than the 18k Pony Club Kestrel ride on offer. We had been warned that Tugby was quite a hilly ride, and given the weather was really quite hot we knew that this ride would be a challenge of Tally and Shine’s fitness. We normally take two 5 gallon barrels and a box of a dozen slosh bottles, and thought that this might not be enough. To make things worse we realised that we had forgotten our bucket of sugar beet water, which is normally the only way to get Shine and Tally to take on water when we are doing these rides. We were also told that there were limited places that the crew could meet us, as on the first part of the rides the tracks were all cross country, and we were not supposed to crew in the villages. However, many of the fields were stock fields with troughs and there were also two fords that we had to cross that would provide water on route. We left the venue and had to try hard to persuade the horses to go through a terribly scary and obviously carnivorous gate. It would have been embarrassing if we could not even get out of the farmyard. However after a fair bit of kicking and badgering we then got underway. A good proportion of the first part of the ride was across farm fields and good grass tracks but within about 2k of the start we met the first hill, whilst it was not too steep it was quite long. We then continued over a series of rolling hills across some really lovely countryside. It is a very pretty part of the country and has some very good riding tracks. Large numbers of ramblers was also using these tracks on the day. This meant that at times we had to restrict our longer faster canters, and revert to trot and walk. There also seemed to be a moratorium on marking the route with the normal paint arrows within the villages. As such it was important to be able to read a map properly to ensure that we took the correct route. Having limited crewing points on the first part of the ride, is not normally too much of an issue whilst you are still fairly fresh. However with the hot weather both ponies were soon sweating up nicely and so seeing Nikki just before checkpoint 2 which was 12k into the ride provided some welcome relief. We normally try to meet up about 4 times approximately equidistant on a 34k ride, so 12K seemed a long way. Excessive amounts of water were applied to both horses via slosh bottles and sponges, which they were obviously grateful for, as they did not do their normal dancing about. One of the good things about a hot day is that you do not have to worry about the horses getting cold if you apply a lot of water at the crew points, as within 5 minutes of setting off they were dry again. We had tried to get both ponies to drink from one of the troughs on the first part of the route without success; so I decided that I would tie a sponge to my saddle so that we could try to cool off the horses when apart from the crew points. The next 5k was all cross country again this time predominantly downhill where we got to one of the fords that we were told about. We were all pretty hot again by this point so we again tried to get Tally and Shine to drink, and then I got off to sponge them down. Zip up joddy boots and chaps are very comfortable but they do leak when you are paddling in the ford. However as an example of how hot is was my boots looked dry by the time I had remounted, and my feet felt dry after about 2 minutes. We went onto Tilton on the Hill which, was about half way. Again there were no markings so we had to check the map carefully. On the way out of the village we had to go down a fairly steep hill, which given we were on tarmac meant that we had to stick to walk. Because of this we both got off and walked with the ponies in hand, so as to give their backs a rest. However once we got to a flat bit we got back on in order to trot on some more. By this time in the ride we had a good indication of the toll the hills and heat were taking on Tally and Shine. We normally start off fast so as to give ourselves some leeway for getting lost and to allow ourselves the chance to come in slowly, so as to improve the horse’s final pulse rates. We normally aim to do the first half of the ride at an average speed of at least 12kph, and aim to finish at an average of 10kph. Since we started doing graded rides we realised that the optimum speed to get a grade 1 pass is 10kph, as this gives the best range of pulse rates that lead to a grade 1. On this ride at the half way point we were averaging only 9kph, which was a bit too close for comfort to the minimum speed of 8kph. When we came to another stretch of cross country a couple of riders on the 42k route came up behind us. They also complained that their horses were making heavy weather of the ride. However as soon as they went in front both Tally and Shine suddenly found their second wind, no way were they going to be overtaken! So the four of us went on together for the next few kilometres taking turns in “towing” each other, to the next crewing point. Nikki provided drinks and slosh bottles to us and our two new companions. Then on we went across the fields again. Just as we were coming to about 24k on the route trotting along a stony track I thought we were scuppered, as Tally picked up a large stone in his hoof and immediately started hopping. I got off and checked all his feet for stones or cuts. The two experienced riders we were with said that his hoof might be bruised and that he may walk it off. So for the next kilometre or so I walked beside him. Once off the stony track I got back on again, and Tally seemed fine, the only sign of being foot sore was when we had to go through a long deep ford with a stony bottom, which he obviously did not like. However once we got back onto the road he was happy to trot on so there could not have been much wrong. Nikki met us again about 2k from the finish for a final slosh down, we were still at about 9kph average speed, as such we basically aimed to take it easy getting back to the venue so as to keep the horses pulses as low as possible. Once back at the venue we stripped off the tack and then sloshed the horses down, and then walked them around to stop any stiffness and then off to the vets for a trot up and pulse check. All told we ended up using more than 15 gallons of water both at checkpoints on the ride and at the cooling down sessions at the end. Given the terrain and heat we knew that we were not going to get a grade 1 this time. So we waited for the results and were pleased when Natasha and Shine had a grade 3 whilst Tally and I got a grade 4. Whilst it was a very challenging ride I can recommend Tugby as a good ride with some excellent riding tracks across lovely country.